A new study by researchers with the Lawrence Berkeley National Laboratory (Berkeley Lab) shows that ozone can react with the nicotine in secondhand smoke to form ultrafine particles that may become a bigger threat to asthma sufferers than nicotine itself. These ultrafine particles also become major components of thirdhand smoke – the residue from tobacco smoke that persists long after a cigarette or cigar has been extinguished. “Our study reveals that nicotine can react with ozone to form secondary organic aerosols that are less than 100 nanometers in diameter and become a source of thirdhand smoke,” says Mohamad Sleiman, a chemist with the Indoor Environment Department of Berkeley Lab’s Environmental Energy Technologies Division (EETD) who led this research. Results of this study have been reported in the journal Atmospheric Environment in a paper titled “Secondary organic aerosol formation from ozone-initiated reactions with nicotine and secondhand tobacco smoke.” Co-authoring this paper with Sleiman were Hugo Destaillats and Lara Gundel, also with EETD’s Indoor Environment Department, and Jared Smith, Chen-Lin Liu, Musahid Ahmed and Kevin Wilson with the Chemical Dynamics Group of Berkeley Lab’s Chemical Sciences Division. The study was carried out under a grant from the University of California’s Tobacco-Related Disease Research Program. The dangers of mainstream and secondhand tobacco smoke, which contain several thousand chemical toxins distributed as particles or gases, have been well documented. This past February, a study, also spearheaded by Sleiman, Destaillats and Gundel, revealed the potential health hazards posed by thirdhand tobacco smoke which was shown to react with nitrous acid, a common indoor air pollutant, to produce dangerous carcinogens. Until now, however, in terms of forming ultrafine particles, there have been no studies on the reaction of nicotine with ozone. Released as a vapor by the burning of tobacco, nicotine is a strong and persistent adsorbent onto indoor surfaces that is released back to indoor air for a period of months after smoking ceased. Ozone is a common urban pollutant that infiltrates from outdoor air through ventilation that has been linked to health problems, including asthma and respiratory ailments. 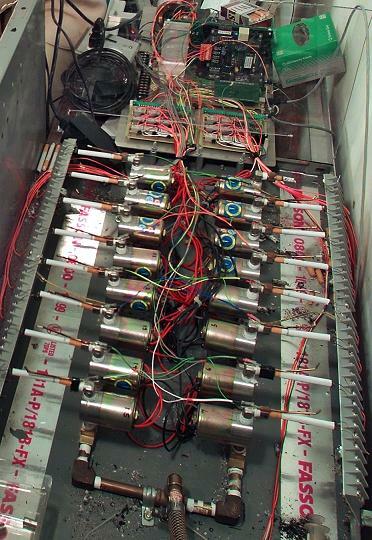 To identify the products formed when nicotine in secondhand smoke is reacted with ozone, Sleiman and his co-authors utilized the unique capabilities of Berkeley Lab’s Advanced Light Source (ALS), a premier source of x-ray and ultraviolet light for scientific research. Working at ALS Beamline 9.0., which is optimized for the study of chemical dynamics using vacuum ultraviolet (VUV) light and features an aerosol chemistry experimental station, the researchers found new chemical compounds forming within one hour after the start of the reaction. While the findings in this study support recommendations from the California EPA and the Air Resources Board that discourage the use of ozone-generating “air purifiers,” which among other applications, have been used for the removal of tobacco odors, the Berkeley Lab researchers caution that the levels of both ozone and nicotine in their study were at the high end of typical indoor conditions.